Hit & Run was sold in 1988 and '89 in the above package. He was also paired with a parachute pack and sold as a 1988 Target exclusive. Target exclusive Hit & Run photos from the collection of Chris Cardillo. Please check him out on eBay, or give him a shout on twitter. File card courtesy of Dan Carroll. 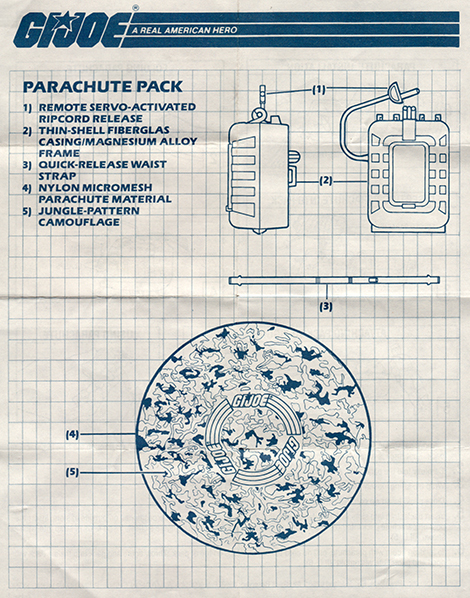 Parachute Pack blueprint/instructions courtesy of Tim Dz.